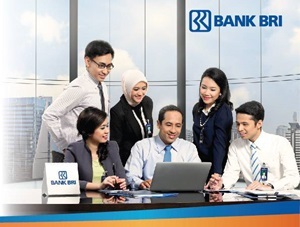 PT Bank Rakyat Indonesia (Persero) Tbk – Bank BRI is a leading state-owned bank in Indonesia. Bank BRI has major business competencies in Micro Banking, Retail Banking and Middle and Corporate Banking. Bank BRI is a public-listed bank and is majority owned by the Government of Indonesia. Bank BRI’s shares are listed on the Indonesia Stock Exchange (IDX) with stock code BBRI. As today, the Government of Indonesia holds 56.75% shares in Bank BRI which represented by the Minister of State-Owned Enterprises (SOE). Other 43.25% remaining shares in Bank BRI was owned by general public and investors. In term of financial performance, Bank BRI keeps growing with sustainable performance in the business year of 2017. Bank BRI managed to record total assets of Rp1,126.3 trillion in 2017, according to information found in PT Bank Rakyat Indonesia (Persero) Tbk Annual Report 2017 as cited by JobsCDC.com. This total assets number is grew 12.2% Year on Year (YoY) from Rp1.003,6 trillion in 2016. For total income for the year 2017, Bank BRI recorded growth by 10.7% in 2017 to become Rp29,04 trillion. Bank BRI’s total income for the year 2016 amounted to Rp26,2 trillion. Minimum S1 degree from all accredited departments / faculties (PTN / PTS). Minimum Grade Point Average (GPA) of 3.01 (scale 4.00). Maximum age of 30 years old (not yet turning 31 years old by the initial selection). Minimum 2 years of experience in the field of banking/financial institution marketing in the same company and proven by a Work Certificate. Have no nuclear family relationship at BRI. Ready to work with challenging targets. Good looking and have a wide networking and have the spirit of marketing. Able to use MS Office. Must have SIM C, preferably also have SIM A. Willing to be placed in Bank BRI Kanwil Semarang : Bumiayu, Slawi, Brebes, Tegal, Pemalang, Pekalongan, Batang, Kendal, Semarang, Ungaran, Salatiga, Grobogan, Blora, Cepu, Demak, Jepara, Kudus, Pati and Rembang.